British runner Gemma Hockett, aka Marathon Girl, is clearly still delighted about her Half Marathon PB and podium position at OPAP Limassol Marathon GSO in 2018. Coming second in the women’s field in a time of 1:26:19, and collecting a superb trophy as a reward, Gemma had a fantastic race on the flat and fast course and thoroughly enjoyed all that Limassol had to offer. It was such a positive experience for Gemma that she is looking forward to returning to #RunLimassol on 24th March 2019, although this year she’ll be lining up at the start of a different race. Having suffered an injury setback in the latter part of 2018, Gemma will this time be running the Petrolina 10K Energy Race instead of the Half Marathon – and she can’t wait to take on her first 10K in two years. Rather than see it as a Plan B, she sees it as a perfect opportunity to work on some speed and get herself back on the path to marathon fitness. “I loved Limassol so much last year that I really wanted to go back this year,” explains Gemma. “The atmosphere was incredible and everybody was so friendly and caring – I have such good memories of my time there! With just under two months until OPAP Limassol Marathon GSO weekend, Gemma will shortly be heading out to a training camp in Kenya where she will be running at altitude, doing lots of hill work and building up her fitness. Wisely she did not sit still whilst recovering from her injury, using the time to focus on some all-important strength and conditioning instead – meaning that she is now feeling strong and ready to go. Gemma has certainly been going from strength to strength over recent years, having recorded a marathon PB of 2:55:47 at the ASICS Greater Manchester Marathon in April 2018, just one month after achieving her half marathon PB in Limassol. It is clear that Gemma is determined and ambitious, always pushing herself to achieve her goals and then better them. She has an inspiring attitude towards what is possible and is an incredible role model for anyone working towards their own dreams and goals. 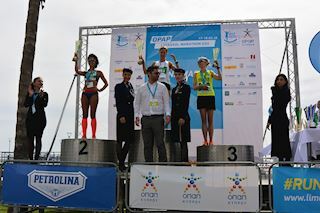 OPAP Limassol Marathon GSO is one of Europe’s most recognisable sporting events, welcoming 15,000 athletes of all nationalities to #RunLimassol each year. It is known for being flat and fast, covering long stretches of traffic-free road including the spectacular coastal road of greater Limassol. With a choice of six race distances and a very real chance to achieve a PB, it is an ideal event for beginners through to elite runners. Participants frequently comment on the friendly welcome, first-class hospitality and relaxing, social atmosphere over the course of the weekend, making it a complete race experience and a must-do date for the spring race calendar. Entry is still open for all races on Saturday 23rd and Sunday 24th March 2019. Gemma is the author of award-winning blog www.themarathongirl.com and you can keep up with her latest news on Twitter and Instagram.